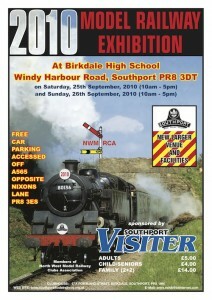 The Friends of the 502 Group will be present at the Southport Model Railway Show for a third year. This year’s event takes place over the weekend of 25/26 September 2010 at Birkdale High School. On our stand there will be group members available to discuss the progress of the preservation project and answer any questions you may have. If you haven’t yet signed up for membership we will gladly take your subs fees on the day! We will also have a range of Class 502 merchandise and souvenirs for sale on our stand, including mouse mats, mugs and key rings. More details of these will be posted on the web site shortly. The Friends of the 502 Group’s Annual General Meeting will take place on Saturday 25th September at the exhibition. Please note that the AGM is open to current group members only. More details about the exhibition, including directions to the venue and details of admission charges, are available at the Southport MRS web site.